Punjab Public Service Commission will release the PPSC Civil Services Prelims Admit Card 2018-2019 in the Upcoming Months. So, the candidates who had applied for the Punjab State Civil Services Combined Competitive Examination need to download the PSCSCCE Prelims Hall Ticket 2018-2019. Furthermore, we have gathered all the information on this page regarding PPSC Civil Services Prelims Call Letter 2018-2019. Therefore, all the aspirants need to refer this article after completing their application process. And, we have given the details of the PPSC Civil Services Prelims Exam Pattern 2018-2019 and PPSC Civil Services Selection Process 2018-2019. In addition to this, we have arranged the Procedure To Download The PPSC Civil Services Prelims Admit Card 2018-2019. Hence, the applicants who are eager to get the Punjab PSC Civil Services Prelims Admit Card 2018-2019 can go through this post. To participate in the PPSC Civil Services Prelims Exam 2018-2019 all the competitors need to download PPSC Civil Services Prelims Admit Card 2018-2019. Thus, to get the admit card candidates need to enter the registration number and password. So, all the applicants need to save the valid details at the time of registration process only. Furthermore, the contenders who had completed their application process are only eligible to download the PSCSCCE Prelims Hall Ticket 2018-2019. Moreover, aspirants need to view their PPSC Civil Services Prelims Call Letter 2018-2019 on the official web portal of PPSC. Hence, we have given the official site details in the below table. In addition to this, the PPSC organization will publish the PPSC Civil Services Prelims Admit Card 2018-2019 for the Punjab Civil Service (Executive Branch), Deputy Superintendent of Police, Block Development & Panchayat Officer and other Vacancies. A couple of days back the Punjab Public Service Commission (PPSC) has released a news for the PPSC Civil Services Recruitment 2018-2019. So, the candidates can apply on or before 23rd April 2018. Furthermore, the Punjab PSC officials are ready to recruit the 67 applicants for the various vacancies. Moreover, we have provided all the recruitment details on our web portal. Thus, competitors can check and apply for the PPSC Civil Services Recruitment 2018-2019. For the applied applicants, the PPSC organization will organize the prelims exam in July 2018. Thus, to participate in the exam the PPSC Civil Services Prelims Admit Card 2018-2019 is the important document. Therefore, we have given the link to download the PSCSCCE Prelims Hall Ticket 2018-2019 on this page. And, once the officials declare the release date of the PPSC Civil Services Prelims Call Letter 2018-2019 we will update the link on this page. Therefore, all the applicants need to visit this page frequently to check the updates related to the Punjab PSC Civil Services Prelims Admit Card 2018-2019. In addition to this, the aspirants can bookmark this page to get the latest notifications. And, we have arranged the syllabus and previous papers for the PPSC Civil Services Prelims Exam 2018-2019. Thus, the competitors can check our site and download to start the preparation. Furthermore, all the candidates need to score the minimum marks in the test to include in the next rounds. Therefore, aspirants need to focus on their preparation. For that purpose, we have provided the detailed PPSC Civil Services Prelims Syllabus, Previous Papers 2018-2019 on our website. So, we suggest the applicants check our portal before planning for their preparation. 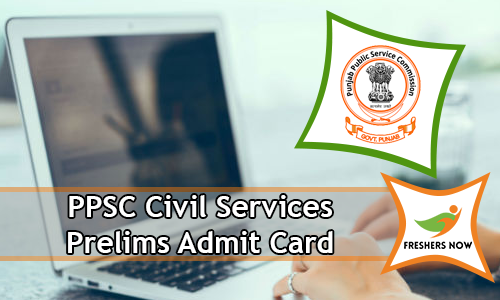 And, check the details about the PPSC Civil Services Prelims Admit Card 2018-2019 on this current article frequently. The Preliminary Examination consists of two papers Paper I and Paper II. Paper I includes General Studies of 100 questions for 200 marks. And, paper II includes Civil Services Aptitude Test (CSAT) of 80 questions for 200 marks. So, the whole test is for 400 marks. There is no negative marking for the examination. Furthermore, aspirants can check our portal to get detailed information about the pattern of the exam. The competitors who had qualified the preliminary examination need to attend for the mains exam followed by the interview. Candidate after downloading the PSC Civil Services Prelims Admit Card 2018-2019 need to check the details given on it. Furthermore, the aspirants find any mistakes they need to inform the officials of PPSC. In addition to this, at the time of examination, the authorities will check all the particulars given on the PSCSCCE Prelims Hall Ticket 2018-2019. Hence, the contenders need to carry one proof issued by the government to the test center. Moreover, the PPSC Civil Services Prelims Call Letter 2018-2019 will also act as an identity for the aspirants during the exam. So, the candidates who are looking for the jobs in Punjab can utilize this opportunity. Moreover, all the applicants need to prepare well for the test. So, the aspirants who are searching for the PPSC Civil Services Prelims Admit Card 2018-2019 in the various web portals can refer this page. Moreover, we have arranged the steps to download the PSCSCCE Prelims Hall Ticket 2018-2019 in this section. All the contenders can check freshersnow.com to get updates like PPSC Civil Services Prelims Admit Card 2018-2019.